I really think that if the Producers want to keep the Pros we still have, they need to figure out how to allow them time to grow and to grow, and expand, and to pursue their careers in directions other than simply Dancing With The Stars. One by one, or more than one by one, we find the Pros branching out, and expanding, and going in more directions. We know Julianne Hough…. She went into Country Music, released one album, and has another album completely finished, and ready for when she has time to devote to promote it the way it should be. Meanwhile, she had a (minor) part in Burlesque, is the lead Ariel in Footloose, which will be released in October, and is currently working on filming Rock of Ages, where she is playing the lead of Sherrie. And, we know that Derek Hough also went into music, he and Mark had their band, Ballas Hough Band, which produced an album. Due to circumstances I don’t know and won’t talk about here, things didn’t seem to work out with the band. And, Derek focused on dance and choreography, and has been featured in (and choreographed) more than one music video or dance for TV, recently for his former gf, Cheryl Cole. And, Derek was absent for Season 12, since he was preparing for, and filming, his feature film. He has the LEAD MALE ROLE of Donny in the Musical/Dance film Cobu 3D. As I mentioned, Mark Ballas began the band, Ballas Hough Band with Derek, but the way things worked, Mark ended up focusing on his solo music career, and he is serious about it. His album is called HurtLoveBox, and is out NOW. We have pros, like Tony, who have been in movies (some pretty recently, but i don’t have more information at this time). We have pros such as Maks and Cheryl who have opened studios. And Tony has joined Maks as a partner. We have several pros who have released exercise DVDs. We have professional choreographers who have choreographed Ballroom With A Twist, and SYTYCD, and shows on Vegas, and…. And, we have at least one author in the group! Lacey Schwimmer is the latest one to add her name into the MUSICIAN bracket, her first single, Love Soundz, will be released on June 21 on iTunes, and was debuted on June 16th on Ryan Seacrests radio show. While she wasn’t ON the show, he did talk about the conversation he had with her, which led me to make the further realization that Julianne (who happens to be friends with Lacey) will never be back…. Ryan asked his favorite question that he loves to ask those who visit his radio show from DWTS. I think he needs to trust his girlfriend. The full text, and the audio of Lacey’s song, can be found here. Now, more importantly were there any hook ups on “Dancing with The Stars” that Lacey could reveal to us? Lacey confirmed that there were a few secret liaisons that she knew about. Click the link above to listen to Lacey’s new song. Personally, I don’t care for it, and I am trying to keep an open mind about it, but I can’t. It feels very processed, and canned…. And, the song itself? My kids range in age from almost 7yo, to 20yo, and I don’t think I want my kids to listen to it. I know my oldest won’t listen to it, since he is into different music, but this is one song i WON’T be guiding my 17yo daughter toward. And as a person, I do like Lacey. Wednesday night Karina Smirnoff dazzled the Red Carpet at the “Green Lantern” premiere in Hollywood. I’m not sure on the designer of this dress, but, we do know the designer of Karina’s EARRINGS >>>> ANNE KOPLIK official jewerly provider to Dancing With The Stars!! Aren’t they beautiful? I want a pair in the worst way!! As readers to this site know, Anne has been giving John some of her fabulous designs to give away in our recent contests. If you are interested in a pair of earrings like Karina’s or another pair, be sure to visit AnneKoplik Designs. Not only are they stylish, they are affordable. Cheryl Burke’s new shoe line has officially been added to the Home Shopping Network. Now fans and customers alike can order them easily on line. As Cheryl promised in the recent past, there is something for everyone and “comfort” is key. “Gel footbeds for ultimate comfort” have been added to each pair. I’m tempted to try a pair and here is my favorite. Which pair do you like? In other news on Cheryl today, she and her little Chihuahua are gracing the cover of Healthy Pet this next month. Be sure to check the cover out >>>>HERE. So cute! Kim, 30, reached out to her former Dancing with the Stars dance partner Mark Ballas to help teach her and her fiance some ballroom dancing moves. The pair were clearly happy with Mark’s dance lesson as they invited him out to a bakery following the private session. The reality star looked chic (per usual) in white skinny jeans and a flow-y beige top. Kim accessorized her look with some tan not-dance-friendly Christian Louboutin platform stilettos and a custom neon yellow Hermes Birkin bag. Kris and Mark, meanwhile, looked more dance lesson-ready in t-shirts and jeans. Kim blogged about hanging out with Mark and his American Idol girlfriend Pia Toscono on her official Celebuzz blog. “I went to Katsuya on Monday night for a fun dinner with Mark, Mark’s girlfriend Pia from American Idol,” Kim wrote earlier this week. “So good to catch up!” And, apparently, plan private wedding dance lessons! Adding: Below is Mark and Pia dining out this week dressed to the nines. Along with being nervous to look too cozy with Pia (and vice versa 🙂 ), he’s asked about Kim’s wedding too, but, won’t disclose anything. Isn’t this cool? 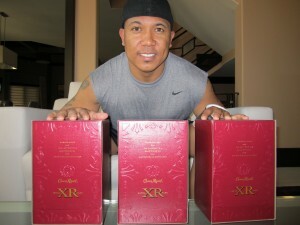 Hines Ward recently thanked the judges on Dancing with The Stars by giving them Crown Royal XR’s. 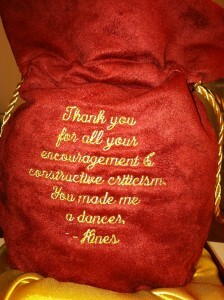 Not only that, he had the bags personally engraved with “Thank you for all of your encouragement and constructive criticism. You made me a dancer. ~Hines” Hines is a huge fan of the whiskey and this isn’t the first time he have it as a gift. He gave the entire Steelers team a bottle of Crown Royal XR after the Steelers won Super Bowl XLIII against the Cardinals as well. Always a class act that one!! You can read more at Nicepickcowher.com.